All transformers undergo a standard series of tests: turns ratio on all taps, polarity, a DC Hi-Potential test at twice the rated line-to-line voltage plus 1,000 volts and induced potential test at twice the rates voltage. Rewound transformers receive those tests along with a test for core loss and excitation current, copper loss and impedance. 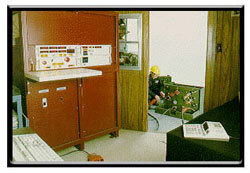 Our DC testing units - designed especially for us - are capable of creating a voltage up to 160 kV DC at 250 milliamps. Quality controlled for confidence We put reliability in writing. Every transformer we recondition or rewind is guaranteed for 18 months against defects in workmanship and materials. If one of our units fails within 18 months from normal use, we'll repair or replace it, or refund your money. Strict quality control is built into every step of the remanufacturing process. A reconditioned unit from T & R Electric receives extensive tests and replacement parts as needed. If a transformer requires a complete rewind, 100 percent copper is used. The oil in all transformers receives IFT, dielectric and PCB tests. Using two filtering systems and the Fuller's Earth process for removing acid from the oil, we guarantee minimums of 26 IFT and 30 kV dielectric strength. Our filtering and storage tanks hold more than 60,000 gallons of oil, with regular filtering system processing 1,800 gallons per hour.